Linktagger, a digital development company based in Rotherham, is aiming to help retailers across the globe to reach potential customers by converting standard advertising hoardings into virtual stores. Based in RiDO's Fusion @Magna business centre, the enterprise was founded by Liam Winder and is using cutting edge technology such as NFC Chips, QR Codes and iBeacon to communicate with the public. 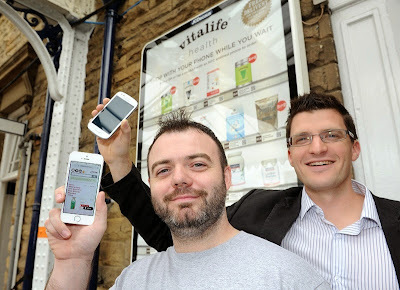 The first example was featured on Rothbiz last month with growing Rotherham health specialist, Vitalife using Linktagger to turn advertising space into shelves full of its products. The concept is being trialled initially in Sheffield, Leeds, and Manchester Piccadilly train stations with "Smart Posters" embedded with NFC Chips and include QR Codes relating to Vitalife's products, with a view to providing an innovative way to increase sales. Liam Winder of Linktagger (pictured, left), said: "The posters are like virtual shopping shelves. You just tap them with your phone or scan the QR code for a product and it takes you through to a "buy now" option. It's a really exciting concept which could lead to huge increases in sales for retailers like Vitalife, in locations that attract large populations, such as city centres and train stations." Linktagger has been able to access support through RiDO's (Rotherham Investment & Development Office) European-funded Soft Landing Zone project to explore international opportunities with RiDO's Nathan Woodcock supporting Liam in the development of CAD drawings for the Linktagger product range and also with securing international patents for his innovative use of technology. Nathan Woodcock, business development co-ordinator for RiDO (pictured, right), said: "Linktagger operates in a fast moving industry with huge opportunities and it has been fantastic to help Liam to research opportunities where his business could expand not just in the UK, but internationally. We are looking forward to seeing how his Smart Poster concept develops, but this is just one of a whole series of exciting concepts where Linktagger could secure market opportunities overseas." Liam added: "It has been fantastic to have the support of RiDO to research the market for my products internationally and also to help with securing worldwide patents. Because what we do uses the latest technology to connect the physical and digital world, it has no boundaries to what applications and countries it could be used in and so we are really excited about the future markets for our products." A serial entrepreneur, Liam has returned from his time consulting after his experiences of running ISP, RipWire, to establish Betacities, which has the aim of helping to bring the physical and online worlds closer together. One example is HelloCity! - a new form of city guide that brings the latest information to the smartphones of visitors and shoppers. It is set to launch first in Rotherham town centre to complement the current paper-based Shop Local scheme with QR Codes mounted in 50 prominent locations around town, linking to information on shopping, places to eat, visitor attractions, events and real-time travel information.